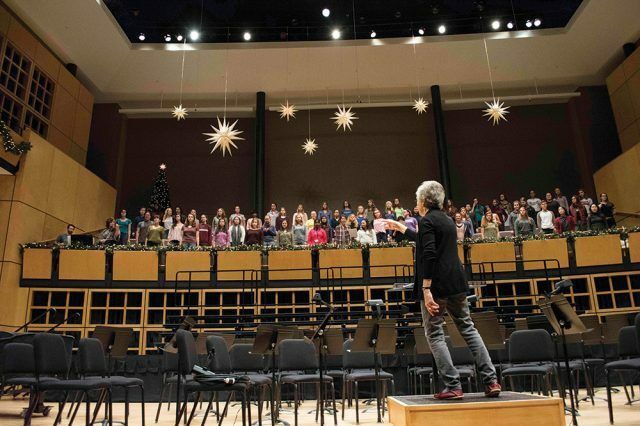 Sauder Concert Hall will again host the annual Festival of Carols. Performances will take place Dec. 7-9. The concert will include performances by the Goshen College Symphony Orchestra, the Goshen College Choirs, and Goshen College music faculty with the expectation of audience participation. This December will mark the fifteenth year of Festival of Carols. Created by former GC choir director, James Heiks, the program has several different aspects that make it to stand out among the other concerts done throughout the year. For example, Festival of Carols always includes audience participation throughout the program. Audience members sing along with college ensembles for about five Christmas carols. Unlike most musical performances, Festival of Carols does not include an intermission which allows audience members to immerse themselves into the performance. Additionally, the program is presented as a worship service instead of a regular music performance. The worship service is based on the Anglican tradition of Lessons and Carols, which includes Biblical readings complemented by music. Each GC ensemble will perform two individual selections during the program. The community children’s choir, Shout for Joy, will also be featured, performing one song. The combined choirs and orchestra will perform selections from Handel’s “Messiah,” including the Hallelujah Chorus. The Women’s Choir will also be performing a song from the oratorio “Considering Matthew Shepard,” a selection previously performed by the professional choir Conspirare as the opening concert of the Performing Arts Series. Festival of Carols will be performed during the weekend of Dec. 7-9. On Friday, Dec. 7 and Saturday, Dec. 8, concerts will begin at 7:30 p.m. On Sunday, Dec. 9, the concert will begin at 4:00 p.m. Sauder Concert Hall, which seats about 900 people, historically sells out for every show. Tickets can be purchased at the Box Office or by phone at (574)-535-7566. Students can buy specially priced $5 tickets for the Friday concert by purchasing them at the Box Office. For all other performances and for the public, tickets can be purchased for $16. It is strongly encouraged to buy tickets in advance. The Communication Department at Goshen College offers majors in broadcasting, communication, journalism and public relations. Concentrations are available in film and multimedia for students who choose to major in communication. The department manages several media properties, including: The Correspondent, a television program; 91.1 the Globe, a radio station; and The Record, a weekly newspaper.